For the first American officer killed by German fire on D-Day, see Robert P. Mathias. For the fictional character, see Bob Mathias (Space: 1999). Robert Bruce Mathias (November 17, 1930 – September 2, 2006) was an American decathlete, two-time Olympic gold medalist in the event, a United States Marine Corps officer, actor and United States Congressman representing the state of California. Mathias was born in Tulare, California. He attended Tulare Union High School, where he was a classmate and long time friend of Sim Iness, the 1952 Olympic discus gold medalist. While at Tulare Union in early 1948, Mathias took up the decathlon at the suggestion of his track coach, Virgil Jackson. During the summer following his high school graduation, he qualified for the United States Olympic team for the 1948 Summer Olympics held in London. In the Olympics, Mathias's naïveté about the decathlon was exposed. He was unaware of the rules in the shot put and nearly fouled out of the event. He almost failed in the high jump but was able to recover. Mathias overcame his difficulties and with superior pole vault and javelin scores was able to push past Ignace Heinrich to win the Olympic gold medal. At age 17, he became the youngest gold medalist in a track and field event. Mathias continued to fare well in decathlons in the four years between the London games and the 1952 Summer Olympics in Helsinki. In 1948, Mathias won the James E. Sullivan Award as the nation's top amateur athlete, but because his scholastic record in high school did not match his athletic achievement, he spent a year at The Kiski School, a well-respected all-boys boarding school in Saltsburg, Pennsylvania. He then entered Stanford University in 1949, played college football for two years and was a member of Phi Gamma Delta fraternity. Mathias set his first decathlon world record in 1950 and led Stanford to a Rose Bowl appearance in 1952, the first nationally televised college football game. After graduating from Stanford in 1953 with a BA in Education, Mathias spent two and a half years in the U.S. Marine Corps. He was promoted to the rank of captain and was honorably discharged. At Helsinki in 1952, Mathias established himself as one of the world's greatest all-around athletes. He won the decathlon by the astounding margin of 912 points, which established a new world record, and he became the first person to successfully defend an Olympic decathlon title. He returned to the United States as a national hero. His 7,887 point total at the Helsinki Olympics remained the school record at Stanford for 63 years until it was broken in 2015 by a freshman, Harrison Williams. In 1952, he was the first person to compete in an Olympics and a Rose Bowl the same year. After the 1952 Olympics, Mathias retired from athletic competition. He later became the first director of the United States Olympic Training Center, a post he held from 1977 to 1983. He and his wife Melba can be seen on the 29th April 1954 edition of You Bet Your Life. During the discussion he mentions a forthcoming film in which the couple played themselves, called The Bob Mathias Story. He also starred in a number of mostly cameo-type roles in a variety of movies and TV shows throughout the 1950s. In the 1959–1960 television season, Mathias played Frank Dugan, with costars Keenan Wynn as Kodiak and Chet Allen as Slats, in the TV series The Troubleshooters, which focused 26 episodes on events at construction sites. In 1960, he also appeared playing an athletic Theseus in an Italian "peplum," or sword-and-sandal, film: Minotaur, the Wild Beast of Crete. 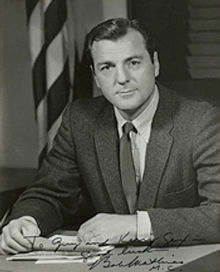 Between 1967 and 1975, Mathias served four terms in the United States House of Representatives as a Republican, representing the northern San Joaquin Valley of California. (These were the same eight years in which Ronald Reagan served two terms as governor of California.) He defeated Harlan Hagen, the 14-year Democratic Party incumbent, by about 11% in the 1966 election. This was not too surprising because this area started to move away from its New Deal Democratic roots. Mathias was re-elected three times without serious difficulty, but in 1974, his district was significantly redrawn in a mid-decade redistricting. His district was renumbered as the 17th District, and picked up a large chunk of Fresno while losing several rural areas. Mathias was narrowly defeated for re-election by John Hans Krebs, a member of the Fresno County Board of Supervisors. Mathias was one of several Republicans swept out in the wake of the Watergate scandal. From June to August 1975, Mathias served as the deputy director of the Selective Service. Mathias also was involved in the unsuccessful 1976 presidential re-election campaign of Gerald Ford. Bob Mathias was diagnosed with cancer in 1996, and died as a result in Fresno, California on September 2, 2006 at age 75. He is interred at Tulare Cemetery in Tulare, California. He was survived by wife Gwen, daughters Romel, Megan, Marissa, step daughter Alyse Alexander, son Reiner, brothers Eugene and Jim, and sister Patricia Guerrero. November 17, 1930 Bob Mathias was born, the second of four children (including older brother Eugene, younger brother James, and younger sister Patricia), to Dr. Charles and Lillian Mathias. 1948 At age seventeen, graduated from Tulare high school after an illustrious high school athletic career in football and track and field. Wins National Decathlon Championship at Bloomfield, N.J. According to the movie (starring himself and his wife) "the Bob Mathias Story" he actually did not have enough credits to graduate from high school, after concentrating solely on all the events of the decathlon- and get into Stanford, so his parents sent him to a prep school out of town where he could make up his academic shortcomings and get into college, as he wanted to be a doctor like his father and older brother Eugene. He qualified for the U.S. Olympic Team and went on to win gold medal in decathlon at the Summer Olympic Games in London, England. After huge celebration and parade in Tulare, presented with "Key to the City" by Mayor Elmo Zumwalt. Enrolls at Kiskiminetas Prep School, Saltsburg, Pa. Honored with the James E. Sullivan Award, presented each year to America's top amateur athlete. 1949 Won National Decathlon Championship at meet held in Tulare. Enrolled at Stanford University, where he starred in track and field and in gridiron football. 1950 Won National Decathlon Championship at a meet held in Tulare. 1951 Mathias played football during junior and senior years at Stanford. In the University of Southern California vs. Stanford football game, Mathias returned U.S.C. 's Frank Gifford's kick-off 96 yards for a touchdown. Spent the summer at U.S. Marine Corps boot camp in San Diego, California. 1952 On New Year's Day, he played fullback for Stanford University in the Rose Bowl. Won the National Decathlon Championship and Olympic Trials at meet held in Tulare. Won the Olympic gold medal in the decathlon at Helsinki, Finland, setting a |world record. 1953 Graduated from Stanford and commissioned as a 2nd Lt in the U.S. Marine Corps. Drafted by the Washington Redskins, though he never played in National Football League. 1954 Married his first wife Melba. They later had three daughters, Romel, Megan, and Marissa. Mathias and his wife starred in the movie The Bob Mathias Story. Entered active duty in the Marine Corps as a second lieutenant. 1954–56 Visited more than forty countries as America's Good Will Ambassador. 1956–60 Continued work for the state department as a good will ambassador to the world. Acting career took off, employed by John Wayne's Batjac Productions. Starred in the movie "China Doll", the TV series The Troubleshooters, the movie "Theseus and the Minotaur" and in the movie It Happened in Athens. 1966 Elected to the U.S. House of Representatives as a Republican, serving four two-year terms. 1974 Lost his re-election for fifth term. 1976 Mathias and Melba are divorced. 1977 Appointed director of U.S. Olympic Training Center in Colorado Springs. Bob and Gwendoyln Alexander married. Gwen has one daughter Alyse from a prior marriage to Bill Alexander, former U.S. Congressman. Bob also has a son Reiner from a prior relationship. Tulare high school stadium renamed in Mathias's honor. 1983 Appointed executive director of the National Fitness Foundation. 1988 Returned to the Central Valley, in rural Fresno County. 1996 Olympian Sim Iness died. He was Mathias's high school classmate and teammate at the 1952 Olympics. Doctors discovered a cancerous tumor in Mathias's throat. June 6, 1998 A tribute dinner honoring Mathias on the 50th anniversary of his first Olympic medal was held in Tulare. More than 300 people from throughout the state attended, including Olympic medal-winners Sammy Lee, Bill Toomey, Dave Johnson and Pat McCormick, and Sim Iness' widow, Dolores. United States Congress. "Bob Mathias (id: M000242)". Biographical Directory of the United States Congress. ^ Crowe, Jerry (3 September 2006). "ob Mathias, 75; Decathlon Ace Was Actor, Congressman". Los Angeles Times. Retrieved 9 April 2014. Wikimedia Commons has media related to Bob Mathias. Boy-wonder Mathias elevated decathlon ESPN.com, 2005. "Bob Mathias". Find a Grave. Retrieved 2008-02-24.